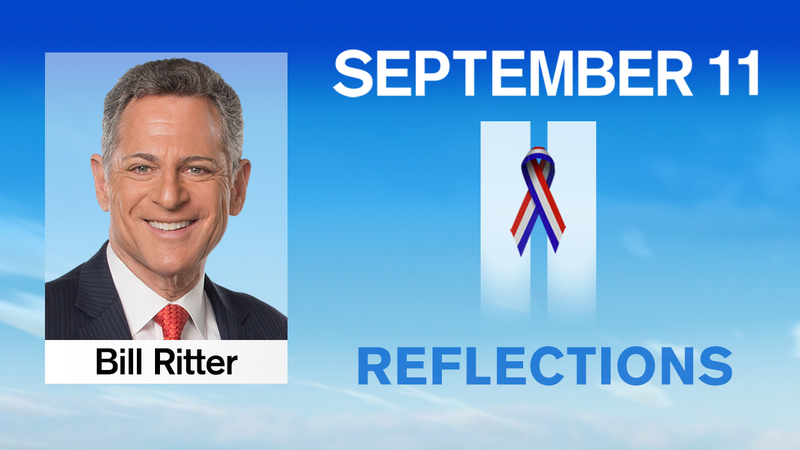 NEW YORK (WABC) -- This will certainly be a different kind of September 11th remembrance this year. The pain of the day, and the sorrow for so many thousands, will still weave through us. But this year. the specter of war looms loud and heavy, and figures to envelope us in a way that could change the way we view the 9/11 memorial service of 2013. President Obama has made his case that we should attack Syria, as a lesson and in retaliation for killing hundreds of Syrian civilians with Sarin gas. And so as we remember the victims of the terrorist attack here, we think of the families wiped out by the senseless and inhumane gassing of more than 1,400 people - including hundreds of children. Evidence points to the Assad regime in Syria doing this to its own people, and while President Assad's brutality is a shock to many - given his education in London as a doctor - we know all too well that evil comes in many forms. And now, as the U.S. seems poised for a military strike against yet another Muslim country, a ray of hope. Congress seems less than eager than the president and likely will not approve Mr. Obama's request for military action. And Russia, of all countries, seems now to be riding to the rescue with a proposal to put Syria's weapons of mass destruction under international control. Eventually, hopefully, those weapons will be destroyed. Like I said, with all this as the backdrop, this could be a different perspective on this year's memorial. One fear - New York could be vulnerable to another terrorist attack in retaliation to any military action against Syria. So while we remember those innocent people whose lives were snuffed out on the crystal clear late summer morning 12 years ago, as we watched the World Trade Center towers attacked, and ablaze, and, in short order, collapse, there is a blanket of tension wrapped around all of us on this anniversary. We are mourning, still, for all those who were killed, and we are weary of what's ahead. That is the backdrop for our remembrance this year. Even as we take part in that annual ritual of recounting where we were and what we were doing when the towers were attacked. I hopped into the shower and turned the TV volume up all the way so I could hear what was happening. It was clearly unclear what was going on. And then another plane hit. I jumped out of the shower, rushed into work, and was on the anchor desk as the second tower collapsed. Lori Stokes and I, and then, later, Sandra Bookman and I stayed on air for hours. Jim Dolan was also there, monitoring the flood of bulletins, including the one that said a United Airlines flight had disappeared from radar somewhere over rural Pennsylvania. It made sense they were connected of course, but we had no confirmation connecting the Pennsylvania crash. Not yet. The emotions 12 years later are, I know, right on the surface. It doesn't take much to bring them up; writing these words is enough to do that. On a personal note, I so wanted to rush home and hug my kids during all this. Alas, when I got home the next day in the middle of the night, they were fast asleep, having left their first day of school in what they had to have known was a cloud of fear. And there would be no school for them - and for millions of others - for several more days. It is easy to talk about closure - but I simply do not believe there is such a thing when it comes to September 11. The wound can scar over, but there is no closure for a wife who no longer has her husband, or for parents whose child was killed, or for a child whose mother perished that day. And so, as we've done on September 11 every year since the attacks, we will remember again this year. I was there for the catastrophe. And I've been there for the memorials. And I will be there for the 12th anniversary.